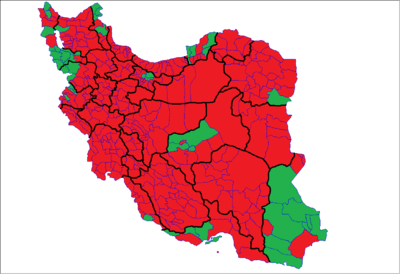 Map showing the votes of the candidates per districts/provinces (reported by Iranian government). Green districts voted for Mousavi. Iran's tenth presidential election was held on 12 June 2009, with incumbent Mahmoud Ahmadinejad running against three challengers. The next morning the Islamic Republic News Agency, Iran's official news agency, announced that with two-thirds of the votes counted, Ahmadinejad had won the election with 62% of the votes cast, and that Mir-Hossein Mousavi had received 34% of the votes cast. There were large irregularities in the results and people were surprised by them, which resulted in protests of millions of Iranians, across every Iranian city and around the world and the emergence of the opposition Iranian Green Movement. Many Iranian figures directly supported the protests and declared the votes were fraudulent. Among them, many film directors like Jafar Panahi (who was consequently banned from making movies for 20 years and condemned to 6 years imprisonment), Mohammad Rasoulof (also condemned to 6 years imprisonment), actors and actresses like Pegah Ahangarani (who was consequently imprisoned), Ramin Parchami (who was consequently condemned to one year imprisonment), sportsmen like the whole Iran national football team who wore green wristbands in their game against South Korea to support the movement, scholars like Mostafa Tajzadeh, Mohsen Aminzadeh, Akbar Ganji, Mohsen Sazegara, many religious figures like Mohsen Kadivar, Grand Ayatollah Yousef Saanei, Grand Ayatollah Sayyid Ali Mohammad Dastgheib Shirazi, traditional singers like Mohammad Reza Shajarian, defected Basij and Iranian Revolutionary Guards like Amir Farshad Ebrahimi and those who confessed with covered faces. The Green Movement of Iran continued its peaceful protests until 14 February 2011 and radicalized itself demanding a total regime change and departure of Khamenei from power. Ahmadinejad became President of Iran after the 2005 election. The losing candidates at that time claimed irregularities at the polls, but the charges were not investigated. A formal protest to the Guardian Council was made and the group dismissed it without comment. His victory had surprised most observers of the campaign. At that time the reformist camp had mostly either boycotted elections entirely or held back out of disillusionment with past lack of progress. The voting for the 2009 election was scheduled for 12 June 2009 and ended up being extended until midnight that day because the turnout was unexpectedly high. Voting ended up proceeding four hours longer than originally scheduled. The President is elected by direct vote, however candidates for the presidency must be approved by the 12-member Council of Guardians. Candidates need to win a majority (more than half) to become President. Iran has a two-round system: if none of the candidates wins the majority in the first round, the top two candidates will go to a run-off. The first round was held on 12 June 2009; the run-off would have been held one week later, on 19 June 2009. All Iranian citizens of age 18 and up are eligible to vote. Both the Iranian Center for Statistics and the Iranian Ministry of the Interior stated that there were around 46.2 million eligible voters. On 20 May 2009, the Guardian Council officially announced a list of approved candidates, while rejecting a number of registered nominees. Only four candidates were approved by the Guardian Council, out of the 476 men and women who had applied to seek the presidency of Iran in the 2009 election. The following people were said to be possible candidates in the election, but did not register within the five days allowed for registration. Akbar Hashemi Rafsanjani, former President and chairman of the Assembly of Experts, would have been over 75 years old on the election day and therefore ineligible to run by election law. The incumbent was Mahmoud Ahmadinejad. The Iranian reform movement attempted to unite behind a single candidate; former President Mohammad Khatami had been the leading opponent to Ahmadinejad in some opinion polls until he withdrew and endorsed former Prime Minister Mir-Hossein Mousavi. Former Speaker of the Majlis Mehdi Karroubi, another Reformist, was also running, as was former Commander of Iranian Revolutionary Guard, Mohsen Rezaee, a conservative with a reputation of political pragmatism. The election marked a return to the public spotlight for Mousavi, who had not received much attention since he served as Prime Minister in the 1980s. Reformist opinions galvanized around him as the election grew nearer. He became the symbol for a groundswell of youthful democratic sentiment, despite his personal background and his political views. The Telegraph described the campaign as "unusually open by Iranian standards, but also highly acrimonious." It was marked by heated rhetoric between the incumbent and his challengers. Mousavi and two other candidates said Ahmadinejad had lied about the state of the economy, which was suffering from high inflation and a fall in oil revenues from last year's record levels. Ahmadinejad responded by comparing his opponents to Adolf Hitler, adding that they could be jailed for their comments. "No one has the right to insult the president, and they did it. And this is a crime. The person who insulted the president should be punished, and the punishment is jail... Such insults and accusations against the government are a return to Hitler's methods, to repeat lies and accusations... until everyone believes those lies," Ahmadinejad said. Debates about the economy played the biggest role in the campaign, with the global economic recession looming in people's minds. About one in five Iranians live under the poverty line, inflation is at about 25 percent, and unemployment is at over 12.5 percent (some unofficial estimates report it as 30 percent). Mousavi advocated further privatization of the economy towards a free market with a tight monetary policy in comparison to Ahmadinejad's populist fiscal policy, with Ahmadinejad making measures to fight poverty a key principle in his campaign. Mousavi drew his electoral base from the middle and upper classes while Ahmadinejad drew support from the urban poor and rural residents. Civil servants, police officers, pensioners, and others dependent on the government also contributed to Ahmadinejad's base. He made financial support from the business class against him into a theme of attack. BBC News described his campaign as "one that foresees the death of capitalism". Mousavi also criticized Ahmadinejad for diplomatically isolating Iran by denying the Holocaust and making anti-Western speeches. He opposed the government's current strict enforcement of Islamic dress and social behavior as well, calling for an end to the regime's 'Vice Police'. He advocated letting private individuals and groups own Iranian media. Both candidates strongly supported further development of the Iranian nuclear program. However, Mousavi advocated a less combative and tense tone with other nations about the program. He also floated the idea of an international consortium overseeing uranium enrichment in Iran. The BBC stated about Mousavi that "[i]n foreign affairs, he seems to be offering little change on major issues". Council on Foreign Relations Senior Fellow Mohamad Bazzi stated that "[i]f Mousavi wins, it could create a new opening for dialogue with the United States. Ahmadinejad's continued presence would be a major obstacle". Robert Fisk also remarked that a Mousavi victory would mean closer ties to the U.S. The campaign was the most expensive in the Islamic republic's history, with the two main candidates spending more than tens of millions of dollars in bid to convince voters to support them. Funds were spent on, among other things, a mass distribution of computerized propaganda, such as CDs and DVDs. Another interesting phenomenon which took place during the campaign was a dramatic rise in the number of text messages sent to Iranian cell phone subscribers, from 60 million messages a day to some 110 million. 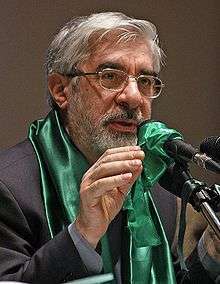 Mousavi adopted the traditional Islamic color, green, as a campaign symbol. Young male supporters wore green ribbons tied around their wrists and young female supporters wore green headscarves. Activists used the term 'Change' as his main slogan, chanting phrases such as "Green change for Iran", "Together for change", and "Vote for change". From 2 to 8 June 2009 Islamic Republic of Iran Broadcasting reported nightly debates on TV channel IRIB 3 between two candidates at a time, with each candidate facing the others once. This was the first time Iran had held televised debates between candidates. Each debate lasted for around one and a half hours. During the debate on 3 June between President Ahmadinejad and reformist rival, former Prime Minister Mousavi, Ahmadinejad made accusations regarding former presidents Mohammad Khatami and Akbar Hashemi Rafsanjani and the Iranian Revolution. Rafsanjani responded to these charges on 9 June in an open letter to Supreme Leader Ayatollah Ali Khamenei requesting that he stepped in to rebuke Ahmadinejad for his comments at the debate. The opinion polls in Iran were considered unreliable. A number of polls conducted between relatively small voting groups, like university students and workers, were reported as election propaganda. More general polls reported in the media did not state the polling organization nor the basic facts about the methodology. The results showed a high variance and depend heavily on who was reporting the poll. In 2002, the polling organization Ayandeh and another polling organization was closed and its directors were arrested. The director of Ayandeh, Abbas Abdi, spent several years in prison. Mousavi's and Karroubi's campaign posters in Tehran claimed that a high turnout would reduce Ahmadinejad's chance of winning the election. Karroubi's campaign manager, Gholamhossein Karbaschi, claimed that the chance of Ahmadinejad losing the election would be over 65 percent if over 32 million people voted, but less than 35 percent if less than 27 million people voted. A post-election national poll was conducted in late August and early September 2009 by the American polling agency, World Public Opinion, which is affiliated to the University of Maryland. Of the initial 46% respondents of the poll, 27% did not state their chosen candidate, 55% said that they had voted for Ahmadinejad. Both Mr Karroubi and Mr Rezai received minimal support. 87% of respondents replied that they had voted compared to 85% according to the official figures, which is within the margin of error provided. Also, the survey found that 62% of Iranians had "strong confidence" in the election result whilst 64% expressed a similar feeling towards the incumbent president. This finding almost exactly matches up with the proportion of the vote that Ahmadinejad received. 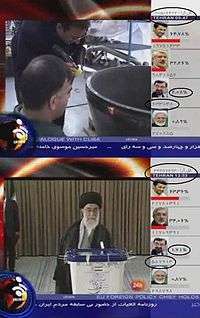 Two screenshots from IRINN, Iranian state-run television illustrating the apparent decrease in votes for candidate Mohsen Rezaee over a four hour period. The upper picture shows Rezaee with 633,048 votes at 09:47; the lower shows the same candidate with 587,913 votes at 13:53 later that day. Mohsen Rezaee's official website published the screenshots and stated that never during the vote counting in Iran had the counted votes of candidates dropped. On 1 June, a campaign office of Ahmadinejad's primary opponent, Mir-Hossein Mousavi, was torched. The office was located in the city of Qum . No group claimed responsibility for the attack. At the same time, it was reported that an assassination had been attempted against former president Mohammad Khatami by means of a bomb placed on an aircraft he was to board. Mobile phone communications were interrupted in Tehran on election day and the BBC has stated that "heavy electronic jamming" was being used to halt their broadcasts. On 23 May 2009, the Iranian government temporarily blocked access to Facebook across the country. Gulf News reported that this move was a response to the use of Facebook by candidates running against Ahmadinejad. PC World reported that Mousavi's Facebook page had more than 6,600 supporters. Access was restored by 26 May 2009. The New York Times quoted an unnamed employee of the Interior Ministry claiming that "the government had been preparing its fraud for weeks, purging anyone of doubtful loyalty and importing pliable staff members from around the country." The New Yorker stated that "dissident employees of the Interior Ministry... have reportedly issued an open letter" saying that the election was stolen. The Guardian has also mentioned "reports of a leaked interior ministry figures allegedly suggesting Mousavi had won", although the article questioned the credibility of the report. The Guardian reported on 17 June 2009 that an Iranian news website identified at least 30 polling sites with turnout over 100% and 200 sites with turnout over 95%. On 21 June 2009, a spokesman from the Guardian Council (an organ of the Iranian government) stated that the number of votes cast exceeded the number of eligible voters in no more than 50 cities, something the Council argued was a normal phenomenon which had taken place in previous elections as people are not obliged to vote where registered (when they have been born). On 18 June, Iranian film makers Marjane Satrapi and Mohsen Makhmalbaf appeared before Green Party members in the European Parliament to present a document allegedly received from a member of the Iranian electoral commission claiming that Mir-Hossein Mousavi had actually won the election, and that the conservative incumbent Mahmoud Ahmedinejad had received only 12% of the vote. Most of official objections to the election filed by Mousavi are related to issues before election  like misuse of government resources by Ahmadinejad in his election campaign. Eric A. Brill claimed there are no grounds to suspect the occurrence of fraud. For example, Mousavi claimed that over 10 million people had voted without proper identification, but his official complaint mentioned only 31 such voters. Widespread ballot-box stuffing was alleged, but no single stuffed box has ever been identified. Buying and selling of votes was alleged, but Mousavi has identified only four instances, and failed to provide any evidence. Thousands or millions of Mousavi votes were claimed to have been thrown away and replaced by Ahmadinejad votes, but no one has identified any of the perpetrators, nor mentioned exactly where or how this was accomplished. Vote counts from the field, approved in writing by Mousavi's observers, were said to have been altered by the Interior Ministry, but nobody has identified a single ballot box where this occurred even though the data has long been available to compare the counts for all 45,692 ballot boxes. On the other hand, several supporters of green movement have continued to repeat the evidence supporting the alleged vote rigging. Reza Esfandiari and Yousef Bozorgmehr also maintain that the election data does comport to a natural outcome, allowing for some possible fraud at the local level. Mohtashami, former interior minister of Iran, who was in the election monitoring committee of Mousavi's campaign claimed that according to official censuses, the number of counted votes in 70 municipalities were more than the number of eligible voters who lived in those regions. In all those cities Ahmadinejad won by 80% to 90% However, "excess votes" have been common in all Iranian elections partly due to the way eligible voters are counted. For example, the Interior Ministry based their calculation of eligible voters on birth certificate registrations. Iranians do not register to vote and hundreds of thousands regularly vote outside their own regions. Shemiran, which had the highest excess voter turnout (13 times the number of eligible voters), overwhelmingly voted for Mousavi. On 17 June, Tabnak, the news agency close to defeated candidate Mohsen Rezaei who got only 678,240 votes in the election stated that "Mohsen Rezaei, until yesterday afternoon, found evidence that proves at least 900,000 Iranians, who had sent in their national ID card numbers, voted for [him]." However, there is no way of independently verifying whether those who disclosed their ID numbers had actually voted for Rezaei. BBC Iranian affairs analyst Sadeq Saba found abnormalities in the way results were announced. Instead of results by province, the "results came in blocks of millions of votes," with very little difference between the blocks in the percentages going to each candidate. This suggested that Mahmoud Ahmadinejad did equally well in rural and urban areas, while his three opponents did equally badly in their home regions and provinces as in the rest of the country. This contradicted "all precedent in Iranian politics", where Ahmadinejad had been very popular in rural areas and unpopular in the big cities, where ethnic minorities had favored anti-establishment candidates, and where candidates had tended to carry their home provinces. Another anomaly, according to British-based researcher Ali Alizadeh, is that a large turnout did not favor the opposition, since in elections, both in Iran and abroad, "those who usually don’t vote, i.e. the silent majority, only come out when they want to change the status quo." According to modern Middle Eastern and South Asian historian Juan Cole, there were several anomalies in the election results. Official reports gave Ahmadinejad 50% of the vote in Tabriz despite the fact that this was the capital of Mousavi's home province, Eastern Azerbaijan, where Mousavi's rallies were well attended and which has traditionally given good turnouts for even "minor presidential candidates" who came from the province. Ahmadinejad also won Tehran province by over 50%, but crucially lost to Mousavi in the actual city of Tehran and was also soundly beaten in the affluent suburb of Shemiran to the north of the capital. Statistical analyses of the official election results were published in Journal of Applied Statistics, an online note, in blogs, and in The Washington Post. Clashes broke out between police and groups protesting the election results from early morning on Saturday onward. Initially, the protests were largely peaceful. However, as time passed, they became increasingly violent. Some protesters began to get violent after the results of the election were announced. Angry crowds in Tehran broke into shops, tore down signs, and smashed windows. Civil unrest took place as protesters set fire to tyres outside the Interior Ministry building and others formed a human chain of around 300 people to close off a major Tehran street. The demonstrations grew bigger and more heated than the 1999 student protests. Al Jazeera English described the 13 June situation as the "biggest unrest since the 1979 revolution." It also reported that protests seemed spontaneous without any formal organization. Two hundred people protested outside Iran's embassy in London on 13 June. Ynet stated that "tens of thousands" protested on 13 June. Demonstrators chanted phrases such as "Down with the dictator", "Death to the dictator", and "Give us our votes back". Mousavi urged for calm and asked that his supporters refrain from acts of violence. Ynet reported on 14 June that two people had died in the rioting so far. That day, protests had been organized in front of the Iranian embassies in Turkey, Dubai, Paris, Berlin, London, Rome, Sydney, Vienna and The Hague. In response to the reformist protests, tens of thousands of people rallied in Tehran on 14 June to support the victory of Ahmadinejad. On 15 June, Mousavi rallied, with anywhere from hundreds of thousands to three million, of his supporters in Tehran, despite being warned by state officials that any such rally would be illegal. The demonstration was Mousavi's first public appearance after the election. Protests focused around Azadi Tower, around which lines of people stretched for more than nine kilometers met. Gunshots were reported to have been fired at the rally, where Mousavi had spoken to his supporters saying, "The vote of the people is more important than Mousavi or any other person." All three opposition candidates appeared. Competing rallies for Mousavi and for Ahmadinejad took place on 16 June. The pro-Ahmadinejad protesters, chanting the phrases "Death to America!" and "Death to Israel! ", outnumbered their opponents, but they did not match the numbers of opponents who had protested the day before. Reports from the state media and elsewhere stated on 16 June that seven people have died in all of the protests so far. However, The Times quoted a Rasoul Akram Hospital nurse that day who asserted that 28 people have suffered from "bullet wounds" and eight have died so far. Over half a million reformist Iranians marched silently from Haft-e-Tir Square to Vali Asr Square on 17 June. That day, the Iranian opposition group, "Human Rights Activists News Agency", stated that 32 people had died protesting during the events of 24 and 25 June. On the weekend of 13 and 14 June, in a series of raids across Tehran, the government arrested over 170 people, according to police officials. Among them were prominent reformist politicians, including MIRO founder Behzad Nabavi, IIPF leader Mohsen Mirdamadi, and former president Mohammad Khatami's brother Mohammad-Reza Khatami, who was later released. Also arrested were Mostafa Tajzadeh and Mohsen Aminzadeh, whom the IRNA said were involved in orchestrating protests on 13 June. Anonymous sources said that the police stormed the headquarters of the IIPF and arrested a number of people. Iranian journalist Mashallah Shamsolvaezin claimed that Mousavi was put under house arrest, although officials denied this. An estimated 200 people were detained after clashes with students at Tehran university, although many were later released. Acting Police Chief Ahmad-Reza Radan stated via the state press service on the 14th that "in the interrogation of related rebels, we intend to find the link between the plotters and foreign media". A judiciary spokesman said they had not been arrested but that they were summoned, "warned not to increase tension," and later released. Intelligence minister Gholam Hossein Mohseni-Ejehei linked some arrests to terrorism supported from outside Iran, stating that "more than 20 explosive consignments were discovered". Others, he said, were "counter-revolutionary groups" who had "penetrated election headquarters" of the election candidates. On 16 June, Reuters reported that former vice-president Mohammad-Ali Abtahi and former presidential advisor Saeed Hajjarian had been arrested. Human rights lawyer Abdolfattah Soltani, who had been demanding a recount of all votes, was also arrested on the Tuesday according to Shirin Ebadi, who said that security officials had posed as clients. Over 100 students were arrested after security forces fired tear gas at protesters at Shiraz university on the same day. Reporters Without Borders reported that 5 of 11 arrested journalists were still detention as of 16 June, and that a further 10 journalists were unaccounted for and may have been arrested. On 17 June, former foreign minister and secretary-general of the Freedom Movement of Iran, Ebrahim Yazdi, was arrested while undergoing tests at Pars hospital in Tehran. He was held overnight in Evin Prison before being released and returning to hospital, where according to Human Rights Watch he remained under guard. In Tabriz, other Freedom Movement activists and eight members of the IIPF were arrested, with reports of at least 100 civic figures' arrests. The total number of arrests across Iran since the election was reported as 500. Aaron Rhodes, a spokesman for the international campaign for human rights in Iran, stated that "Iranian intelligence and security forces are using the public protests to engage in what appears to be a major purge of reform-oriented individuals whose situations in detention could be life-threatening". In Isfahan Province, prosecutor-general Mohammadreza Habibi warned that dissidents could face execution under Islamic law. According to the Telegraph, on 14 June "Iran's regime was doing its utmost to choke off the flow of news from its capital." Reporters from the Italian public television broadcaster RAI stated that one of its interpreters was beaten with clubs by riot police and the officers then confiscated the cameraman's tapes. The Al Arabiya's offices in Tehran were closed on 14 June for a week by Iranian authorities, who gave no explanation for the decision. Meanwhile, the director of BBC World Service accused the Iranian Government of jamming its broadcasts to the country. Peter Horrocks said audiences in Iran, the Middle East and Europe had been affected by an electronic block on satellites used to broadcast the BBC Persian Television signal to Iran, adding: "It seems to be part of a pattern of behaviour by the Iranian authorities to limit the reporting of the aftermath of the disputed election". Al Jazeera English leveled allegations of direct media censorship by the Iranian government, stating that "some of the newspapers have been given notices to change their editorials or their main headlines". BBC correspondent John Simpson was arrested, his material confiscated, and then released. NBC News offices in Tehran were raided, with cameras and other equipment confiscated. ABC News reporter Jim Sciutto also has had material taken. People from the German public broadcasters ZDF and ARD have been harassed as well, with men carrying batons and knives reportedly storming the ARD's Tehran office. A BBC corporate official has referred to the network's conflict with the regime as 'electronic warfare'. On 13 June 2009, when thousands of opposition supporters clashed with the police, Facebook was filtered again. Some news websites were also blocked by the Iranian authorities. Mobile phone services including text messaging also stopped or became very difficult to use. Specifically, all websites affiliated with the BBC were shut off, as were ones with The Guardian. Associated Press labeled the actions "ominous measures apparently seeking to undercut liberal voices". The restrictions were likely intended to prevent Mousavi's supporters from organizing large-scale protests. The protesters used phone calls, e-mails and word of mouth to get around the measures. Ahmadinejad has responded to concerns by saying, "[d]on't worry about freedom in Iran... Newspapers come and go and reappear. Don't worry about it." In response to the crackdown, anti-regime activists have repeatedly taken down Ahmadinejad's and Khamenei's websites. According to CNN, the United States State Department has worked with Twitter to expand the website's access in Iran. Due to protests, from the opposition, the Supreme Leader approved a partial recount of the results. The recount was random counting of 10% of the ballots. In order to create transparency, a 12 member council, showed the recount on television, and concluded that President Ahmadinejad still led Mousavi after the recount. After the recount, the Guardian council certified the election, and concluded no evidence of irregularities, and closed the dossier on the election. The Iranian government blamed the unrest on a variety of targets, including the Bahá'í Faith who served as "canaries in the coal mine of Iran’s theocracy" as Iran's largest religious minority by their persecution and as "scapegoats". Hadad Adel even claimed that BBC stands for Bahá'í Broadcasting Company and other allegations of Bahá'í involvement with other powers like the Israeli, British and American governments though these accusations had little to do with the religion and rather seemed to be a part of an Islamic repertoire of what a heresy is supposed to look like, and are "categorically rejected" by the Bahá'ís. Supreme Leader Ayatollah Ali Khamenei initially urged the country to unite behind Ahmadinejad, labeling a victory by him as a "divine assessment." On 15 June, however, he ordered an investigation into the claims of vote fraud. Referring to Mousavi's appeal letter about the irregularities, Khamenei said "the Guardian Council has been emphasized to carry out investigation into this letter carefully," and probe allegations of Ahmadinejad cheating. Former Interior Minister Sadeq Mahsouli said that he had not received any "written complaint" about election fraud or irregularities. He also remarked that the vote proceeded in a way that "ruled out the possibility of cheating." Chairman of the Assembly of Experts Akbar Hashemi Rafsanjani was reported to have called a meeting of the Assembly, as they had the constitutional power to elect and dismiss the Supreme Leader. Incumbent President Mahmoud Ahmadinejad, in a live address on state run television on 13 June, called the election "completely free" and the outcome "a great victory" for Iran. He also said, "[t]oday, the people of Iran have inspired other nations and disappointed their ill-wishers... propaganda facilities outside Iran and sometimes inside Iran were totally mobilized against our people." Ahmadinejad praised the country’s youth as well, but made no direct mention of the protests. He later dismissed the protests, comparing them to "the passions after a football match." In his 25 September 2009 speech at the UN he stated "Our nation has successfully gone through a glorious and successfully democratic election, ... They entrusted me once more with a large majority ..."
Mir-Hossein Mousavi, the main opposition candidate, issued a statement saying, "I'm warning that I won't surrender to this manipulation." Mousavi lodged an official appeal against the result to the Guardian Council on 14 June. He was not optimistic about his appeal, saying that many of the group's members "during the election were not impartial." Reformist cleric Mehdi Karroubi, another opposition candidate, echoed Mousavi’s demand for the election to be canceled. He said, "I am announcing again that the elections should not be allowed and the results have no legitimacy or social standing... Therefore, I do not consider Mahmoud Ahmadinejad as president of the republic." He later declared in a speech to his supporters in Khoramabad that "this phase [Election dispute] will not subside until we [Reformist leaders] suggest so." Mohsen Rezai, on 17 June, he gave an ultimatum to Interior Ministry to release details of the results by that day, otherwise he would call for a new election. He said "The unprecedented delay has raised doubts about the possibility of manipulation in the results." However, on 24 July he withdrew formal complaints filed with the Guardian Council, saying that "The [current] political, social and security situation has entered a sensitive and decisive phase, which is more important than the election." Gholam Ali Haddad Adel, a former Iranian parliamentary speaker, called on Mousavi to concede defeat, saying that then "everyone will benefit". The Association of Combatant Clerics, a moderate reformist clerical body which former President Khatami is a member of, issued a statement posted on reformist web sites saying the election was rigged and calling for it to be canceled, warning that "if this process becomes the norm, the republican aspect of the regime will be damaged and people will lose confidence in the system." Former Foreign Minister Ibrahim Yazdi said, "[w]e don't have any doubt. And as far as we are concerned, it is not legitimate. There were many, many irregularities." He also described the process as a "coup". On 17 June, he was arrested and transferred to prison. Reformist politician Ata'ollah Mohajerani blasted the election as "The End of the Islamic Republic". Hadi Ghaemi, spokesman for the International Campaign for Human Rights in Iran, denounced the outcome. He also compared the government's post-election activities to those of the Chinese government during the Tiananmen Square protests of 1989. In a letter published on his website, reformist cleric Grand Ayatollah Hossein-Ali Montazeri stated that government used elections "in the worst way possible. Declaring results that no one in their right mind can believe, and despite all the evidence of crafted results, and to counter people protestations, in front of the eyes of the same nation who carried the weight of a revolution and 8 years of war, in front of the eyes of local and foreign reporters, attacked the children of the people with astonishing violence. And now they are attempting a purge, arresting intellectuals, political opponents and Scientists." The Iranian national soccer team playing in their World Cup Qualifier wore green wristbands in support for Mousavi. Popular classical musician Mohammad Reza Shajarian demanded that Iranian government television and radio never play his music again after Ahmadinejad called Mousavi supporters "brushwood and thorns". Shajarian remarked, "my voice is like brushwood and thorns". British politician George Galloway has stated that Ahmadinejad "is the president of an important country and we'll just have to accept it." 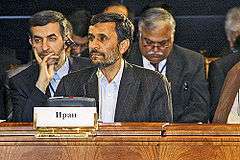 According to three Iranian newspapers 105 of 290 members of the Iranian Parliament invited to attend a 24 June victory party for Mahmoud Ahmadinejad attended the event, suggesting, according to the American New York Times newspaper, "a deep divide within the political elite over the election and its aftermath." In his 19 June address to the nation after Friday prayers, Supreme Leader Ayatollah Ali Khamenei defended the reputations of Hashemi Rafsanjani and Ali Akbar Nateq-Nouri despite the fact that "Never before have I mentioned people by name in the Friday prayer sermons" adding that "The live televised debates were a positive step, but these (accusations against fellow candidates) should be removed. After the debates, I had a talk with the president because I knew he would listen to me." This amounted to a criticism of Ahmadinejad, who had made accusations against Nateq-Nouri's family during the debate and accused Rafsanjani of being "corrupt" and whom he had called "the main puppet master." Many western countries expressed doubt about the result and/or reacted in favour of protestors. Other countries, namely Brazil and some other Asian countries, amongst others, welcomed the result. ↑ "Iran To Hold Presidential Election In June 2009" (Reuters). Radio Free Europe/Radio Liberty. 7 September 2008. Retrieved 2 December 2008. 1 2 "Ahmadinejad Wins Landslide". Iran Daily. 13 June 2009. Archived from the original on 14 June 2009. Retrieved 13 June 2009. 1 2 "Ahmadinejad 'set for Iran victory'". Al Jazeera English. 13 June 2009. Retrieved 13 June 2009. "Doctor Ahmadinejad, by getting a majority of the votes, has become the definite winner of the 10th presidential election," the news agency said. ↑ Worth, Robert F.; Fathi, Nazila (13 June 2009). "Both Sides Claim Victory in Presidential Election in Iran". The New York Times. Retrieved 13 June 2009. The election commission said early Saturday morning that, with 78 percent of the votes counted, Mr. Ahmadinejad had won 65 percent and Mr. Mousavi had 32 percent, Reuters reported. ↑ "Ahmadinejad wins Iran presidential election". BBC News. 13 June 2009. Retrieved 13 June 2009. ↑ Tait, Robert; Black, Ian; Tran, Mark (17 June 2009). "Iran protests: Fifth day of unrest as regime cracks down on critics". The Guardian. London. ↑ "Iranian filmmaker to be honoured in Berlin Festival". Radio Zamaneh. 19 January 2011. Retrieved 7 November 2012. ↑ Dabashi, Hamid (24 December 2010). "Jafar Panahi's reward for bringing cinematic glory to Iran? Jail". The Guardian. London. ↑ "Jailed Iranian Filmmaker Mohammad Rasoulof Delivers An Indictment With "Goodbye"". Indiewire. 8 November 2011. Retrieved 7 November 2012. ↑ "Iranian actor arrested en route to women's World Cup". The Guardian. London. 15 July 2011. ↑ Weaver, Matthew; Nasaw, Daniel (17 June 2009). "Iran protests". The Guardian. London. 1 2 3 4 Colin Freeman; David Blair (14 June 2009). "Defeated Iranian reformist Mir-Hossein Mousavi calls for more protest against Mahmoud Ahmadinejad". The Daily Telegraph. London. Retrieved 14 June 2009. ↑ "Official: Obama Administration Skeptical of Iran's Election Results". Fox News. 13 June 2009. Archived from the original on 14 June 2009. Retrieved 13 June 2009. 1 2 Freeman, Colin (12 June 2009). "Iran elections: revolt as crowds protest at Mahmoud Ahmadinejad's 'rigged' victory". London: The Daily Telegraph. Retrieved 12 June 2009. ↑ Lyon, Alistair (9 February 2009). "Instant View: Iran's election result staggers analysts". Reuters. Retrieved 13 June 2009. 1 2 3 4 5 6 7 8 "Election Battles Turn Into Street Fights in Iran". ABC News. 13 June 2009. Archived from the original on 16 June 2009. Retrieved 13 June 2009. 1 2 Ian Black; Vikram Dodd; Matthew Weaver (15 June 2009). "Iranians march in protest at Ahmadinejad re-election". The Guardian. London. Retrieved 15 June 2009. ↑ "Iran Confirms Ahmadinejad Win After Partial Vote Recount". VOA. 29 June 2009. Retrieved 25 August 2010. ↑ "Iran's Guardian Council Affirms Vote Result; Recount of 10 Percent of Ballot Boxes Certifies Landslide Victory by Ahmadinejad". Encyclopedia.com. 30 June 2009. Retrieved 25 August 2010. 1 2 3 4 Octavia Nasr; Reza Sayah; Samson Desta (16 June 2009). "Rival demonstrations fill Tehran streets". CNN. Retrieved 16 June 2009. ↑ "Amnesty says up to 10 dead in Iran protests". AFP. 19 June 2009. Retrieved 19 June 2009. ↑ "Iran police 'use gas' on protesters". Al Jazeera. 20 June 2009. Retrieved 20 June 2009. 1 2 3 4 5 "Protester Killed After Opposition Rally In Iran". National Public Radio. 15 June 2009. Archived from the original on 18 June 2009. Retrieved 15 June 2009. 1 2 3 4 5 Robert Fisk (14 June 2009). "Iran erupts as voters back 'the Democrator'". The Independent. London. Retrieved 14 June 2009. ↑ Cole, Juan (14 June 2009). "Class v. Culture Wars in Iranian Elections: Rejecting Charges of a North Tehran Fallacy". Informed Comment. Retrieved 14 June 2009. 1 2 3 Bazzi, Mohamad (12 June 2009). "Iran Elections: Latest News". Washington Post. Retrieved 13 June 2009. 1 2 3 Black, Ian (13 June 2009). "Ahmadinejad wins surprise Iran landslide victory". Guardian. London. Retrieved 15 June 2009. ↑ Leyne, Jon (11 June 2009). "Ahmadinejad courts a divided Iran". BBC News. Retrieved 11 June 2009. 1 2 3 4 5 "Q & A: Iran's presidential election". BBC News. 9 June 2009. Retrieved 12 June 2009. ↑ "Iran approves main presidential candidates". BBC News. 20 May 2009. Retrieved 29 May 2009. ↑ Eqbali, Aresu (29 May 2009). "Iranian women need more rights: candidate's wife". AFP. Google News. Retrieved 25 June 2009. ↑ "رفعت بيات: معاون اول من يک زن خواهد بود". Tabnak. Retrieved 29 May 2009. ↑ "اكبر اعلمي اعلام كانديداتوري كرد". Tabnak. Retrieved 29 May 2009. ↑ "شعله‌سعدي: تداركاتچي ها ملت را به عقب بازمي گردانند". Fars News. Retrieved 29 May 2009. ↑ Najibullah, Farangis (17 March 2009). "Khatami Pulls Out of Presidential Race, Backs Another Reformist Candidate". Radio Free Europe/Radio Liberty. Retrieved 10 May 2009. ↑ "Tik News". Tik News. Retrieved 29 May 2009. ↑ "قالیباف احتمال کاندیداتوری انتخابات و ریاست صدا و سیما را تکذیب کرد". IRNA. Retrieved 29 May 2009. 1 2 "Khamenei's 'aide rules out presidential run'". Middle East Times. Agence France-Presse. 26 October 2008. Archived from the original on 15 May 2009. Retrieved 2 December 2008. ↑ Behnegarsoft.com. "پايگاه خبری تحليلی فرارو - روایت پورمحمدي از ماجراهاي آذر 77 و قتل هاي زنجيره يي". Fararu. Retrieved 29 May 2009. ↑ "ابتكار سبز >> حمایت از میرحسین موسوی به جای کاندیداتوری". Greenebtekar.persianblog.ir. Retrieved 29 May 2009. ↑ Rubin, Michael (31 July 2008). "Iran News Round Up". National Review Online. Retrieved 2 December 2008. ↑ Erdbrink, Thomas (18 March 2009). "Khatami Pulls Out of Presidential Race". The Washington Post. Retrieved 18 March 2009. 1 2 3 "Ahmadinejad calls rival Iran candidates 'Hitler'". Haaretz. 13 June 2009. Retrieved 13 June 2009. 1 2 Secor, Laura (13 June 2009). "Iran's Stolen Election". The New Yorker. Retrieved 14 June 2009. 1 2 3 Peskin, Doron (13 June 2009). "Iranian election campaign costs millions". Ynet. Retrieved 13 June 2009. 1 2 3 Hafezi, Parisa (11 June 2009). "FACTBOX: Issues in Iran's presidential election race". Reuters. Retrieved 13 June 2009. 1 2 Keller, Bill (13 June 2009). "Reverberations as Door Slams on Hope of Change". New York Times. Retrieved 13 June 2009. 1 2 3 4 "Ahmadinejad defiant on 'free' Iran poll". BBC News. 13 June 2009. Retrieved 13 June 2009. Pitney, Nico (17 June 2009). "Iran Updates (VIDEO): Live-Blogging The Uprising". Huffington Post. Retrieved 17 June 2009. Pitney, Nico (17 June 2009). "Iran Election Live-Blogging (Wednesday 17 June)". Huffington Post. Retrieved 17 June 2009. Pitney, Nico (17 June 2009). "Iran Election Live-Blogging (Tuesday 16 June)". Huffington Post. Retrieved 17 June 2009. Pitney, Nico (15 June 2009). "Iran Election Live-Blogging (Monday 15 June)". Huffington Post. Retrieved 16 June 2009. Pitney, Nico (14 June 2009). "Iran Election Live-Blogging (Sunday 14 June)". Huffington Post. Retrieved 15 June 2009. Pitney, Nico (14 June 2009). "Iran Updates (VIDEO): Live-Blogging The Uprising (Saturday, 13 June)". Huffington Post. Retrieved 14 June 2009. 1 2 3 Akbar Dareini, Ali (22 May 2009). "Iran reformists hope for high election turnout". Associated Press. Archived from the original on 30 May 2009. Retrieved 30 May 2009. ↑ "Karroubi: Debates can prove who is qualified for president". Tehran Times. 2 June 2009. Retrieved 11 June 2009. ↑ Nafisi, Rasool (11 June 2009). "In Iran, The Election Is Being Televised". Radio Free Europe. Retrieved 11 June 2009. ↑ "Rafsanjani reacts to allegations". Tehran Times. 10 June 2009. Retrieved 11 June 2009. 1 2 "جستارها و گفتارهای حسین قاضیان انتخابات 88؛ نظرسنجی‌‌ها و راهبردها". Daal. 31 August 2008. Retrieved 29 May 2009. 1 2 "نظرسنجی های انتخاباتی: ساختگی یا واقعی؟". BBC Persian. ↑ Muir, Jim (4 November 2002). "Leading Iranian reformist 'arrested'". BBC. Retrieved 29 May 2009. ↑ "Eleven jailed journalists start new year in harsh prison conditions". Reporters Without Borders. Retrieved 29 May 2009. ↑ Ken Ballen and Patrick Doherty (15 June 2009). "The Iranian People Speak". Washington Post. ↑ "Pre-election Iranian poll showed Ahmadinejad support". Reuters. 15 June 2009. ↑ "Pre-election Iranian poll showed Ahmadinejad support". Khaleej Times. ↑ Jim Muir (15 June 2009). "Will Iran's Protests succeed?". BBC News. Retrieved 5 May 2010. ↑ "Thousands of Mousavi supporters defy march ban". The Irish Times. 6 June 2009. ↑ "Iran Election Fraud: Moaddel on Ballen and Doherty". Juancole. 18 June 2009. Retrieved 17 November 2010. ↑ Howard Cincotta. "America". America. Retrieved 17 November 2010. ↑ "Case for Online Polls". Polling Report. 15 January 2007. Retrieved 17 November 2010. ↑ "Public Confidence and the Civil Justice System: What do we know about the issues?" (PDF). 2006. Retrieved 17 November 2010. ↑ "World Public Opinion" (PDF). Retrieved 17 November 2010. ↑ "Poll 9 September" (PDF). ↑ "Iranian Public on Current Issues" (PDF). World Public Opinion. Retrieved 3 October 2009. ↑ "Iran: Worker poll puts reformist presidential candidate ahead". Adnkronos International. 7 April 2003. Retrieved 29 May 2009. 1 2 "Ahmadinejad leads election poll by big margin". Press TV. Retrieved 29 May 2009. ↑ "Karroubi passes rival Mousavi in poll". Press TV. 13 May 2009. Retrieved 24 May 2009. ↑ "Mousavi takes lead in 10 major cities: poll". Press TV. 26 May 2009. Archived from the original on 26 May 2009. Retrieved 27 May 2009. ↑ "Mousavi's votes are increasing and Ahmadinejad's votes decrease". Ghalamnews. ↑ "Karroubi overtakes Mousavi in election poll". Press TV. 30 May 2009. Archived from the original on 30 May 2009. Retrieved 30 May 2009. ↑ "Ahmadinejad (sic) leading polls in major cities". Press TV. Archived from the original on 1 June 2009. Retrieved 1 June 2009. ↑ "Rahbord e Danesh Poll Khordad 13". ↑ "ميرحسين موسوي با 54 درصد در دور اول انتخابات پيروز خواهد شد". ↑ Bahari, Maziyar (16 June 2009). "Secret Poll Shows Voters Turn Against Ahmadinejad". Newsweek. Retrieved 16 June 2009. ↑ "IRIB Poll 8 June". ↑ "Poll 8 June reported by Alef". ↑ "Roozonline Poll Khordad 19". ↑ "Rahbord e Danesh Poll Khordad 19". ↑ "Gradual loss of Rezaee's Votes in IRINN TV". Rezaee. Retrieved 20 June 2009. ↑ "Violence mars Iranian election campaign". The Jerusalem Post. 2 June 2009. Retrieved 13 June 2009. ↑ Hafezi, Parisa (14 June 2009). "Mousavi supporters call protest rally in Tehran". Ottawa Citizen. Retrieved 20 June 2009. ↑ "Iran blocks access to Facebook: report". Gulf News. 24 May 2009. Retrieved 25 May 2009. ↑ "Facebook Blocked in Iran Ahead of Elections". PC World. Retrieved 26 May 2009. ↑ "Iran restores access to Facebook, days after blocking the site". AP. Archived from the original on 20 June 2009. Retrieved 27 April 2009. ↑ Tate, Robert (17 June 2009). "Iran election turnouts exceeded 100% in 30 towns, website reports". Guardian. London. Retrieved 18 June 2009. ↑ "MOI on state TV: Over 100% voted is normal". ↑ "Guardian Council: Over 100% voted in 50 cities". Press TV. 21 June 2009. Retrieved 21 June 2009. ↑ Reals, Tucker (18 June 2009). "Watch". CBSnews. Retrieved 17 November 2010. ↑ "News". Israel National News. Retrieved 17 November 2010. ↑ "نتایج نهایی دهمین دورهٔ انتخابات ریاست جمهوری" (in Persian). Ministry of Interior of Iran. 2009-06-13. Retrieved 2009-06-27. ↑ ghalamnews.ir - de beste bron van informatie over Iran. Deze website is te koop! 1 2 Eric A. Brill (31 March 2010). "Did Mahmoud Ahmadinejad Steal the 2009 Iran Election?" (PDF). Retrieved 18 February 2013. ↑ "Report on the Iranian presidential election 2009". Wepapers. Retrieved 17 November 2010. ↑ "محتشمی پور: آراء ۷۰ حوزه انتخابيه بيشتر از واجدين شرايط است(In Persian)". Radio Farda. 16 June 2009. Retrieved 16 June 2009. ↑ en.trend.az/world/iran/1489549.html "Rezaei finds 'proof' of election fraud" Check |url= value (help). Trend. Retrieved 20 June 2009. ↑ Saba, Sadeq (15 June 2009). "What is the evidence of electoral fraud?". BBC. Retrieved 15 June 2009. ↑ Alizadeh, Ali (18 June 2009). "why are the iranians dreaming again?". Retrieved 25 June 2009. ↑ Cole, Juan (13 June 2009). "Stealing the Iranian Election". Retrieved 11 January 2012. ↑ Roukema, Boudewijn F. (2013-10-18). "A first-digit anomaly in the 2009 Iranian presidential election". Journal of Applied Statistics. Taylor & Francis. arXiv:0906.2789 . doi:10.1080/02664763.2013.838664. ↑ Mebane, Walter R. , Jr. (2009-06-29). "Note on the presidential election in Iran, June 2009" (PDF). University of Michigan. Retrieved 2009-07-01. ↑ Nate Silver (18 June 2009). "Karroubi's Unlucky 7's?". fivethirtyeight.com. ↑ Andrew Gelman (18 June 2009). "Unconvincing (to me) Use of Benford's Law to Demonstrate Election Fraud in Iran". fivethirtyeight.com. ↑ Hensel, Zach (2009-06-24). "Is the devil in the digits?". Retrieved 2009-06-25. ↑ Bernd Beber and Alexandra Scacco (20 June 2009). "The Devil Is in the Digits". The Washington Post. ↑ "Iran election protests turn violent". CNN. 13 June 2009. Retrieved 13 June 2009. 1 2 3 "Poll results prompt Iran protests". Al Jazeera English. 13 June 2009. Retrieved 13 June 2009. ↑ "Manifestation devant l'ambassade d'Iran à Londres" (in French). Yahoo! France. 13 June 2009. Archived from the original on 14 June 2009. Retrieved 13 June 2009. 1 2 3 Cohen, Dudi (14 June 2009). "Tehran youth: I'll never vote in Iran again". YNET. Retrieved 14 June 2009. 1 2 3 "Iranians Protests Across the World (In Persian)". BBC Persian. 14 June 2009. Retrieved 17 June 2009. ↑ "Protesters rally outside Iranian embassy in London". Yahoo! Canada. 14 June 2009. Archived from the original on 29 June 2009. Retrieved 14 June 2009. ↑ "Voto Iran, corteo studenti a Roma" (in Italian). TGCOM. 13 June 2009. Retrieved 14 June 2009. ↑ "Iranian-Australians protest election result". Australian Broadcasting Corporation. 19 June 2009. Retrieved 19 June 2009. ↑ "Tweehonderd demonstranten bij ambassade Iran" (in Dutch). NRC Handelsblad. 14 June 2009. Retrieved 15 June 2009. 1 2 "Crowds join Ahmadinejad victory rally". BBC News. 14 June 2009. Retrieved 14 June 2009. ↑ "Pictures". Twitpic.com. Retrieved 20 June 2009. 1 2 "Tehran's Rallying Cry: 'We Are the People of Iran'". Time Magazine. 15 June 2009. Retrieved 15 June 2009. ↑ Daragahi, Borzou; Mostaghim, Ramin (16 June 2009). "In Iran, rival factions rally after days of unrest". The Los Angeles Times. Retrieved 16 June 2009. ↑ Philippe Naughton; Tony Halpin (16 June 2009). "Ahmadinejad challenger calls off Tehran rally to avert further bloodshed". The Times. London. Retrieved 16 June 2009. ↑ "افزایش تعداد جان باختگان خشونت های اخیر ایران به سی و دو تن (An Increase the Number of Deaths Over Recent Violence in Iran)". Archived from the original on 20 June 2009. ↑ Masses mourn protesters in Iran. BBC News. 15 June 2009. Retrieved 19 June 2009. 1 2 3 Robert F. Worth; Nazila Fathi (14 June 2009). "Opposition Members Detained in a Tense Iran". New York Times. Retrieved 14 June 2009. 1 2 Iran reformists arrested after Tehran riots. The Times. London. 14 June 2009. Retrieved 16 June 2009. ↑ "Iran reformists held after street clashes". BBC News. 14 June 2009. ↑ Mostaghim, Ramin; Daragahi, Borzou (15 June 2009). Iran tries to put a lid on election protests. Los Angeles Times. Retrieved 16 June 2009. 1 2 3 4 5 6 7 Tait, Robert (17 June 2009). Iran elections: mass arrests and campus raids as regime hits back. Guardian. London. Retrieved 18 June 2009. ↑ Bill Keller (16 June 2009). Innocent Googling? No Such Thing in Tehran. New York Times. Retrieved 17 June 2009. 1 2 "Ahmadinejad: Anyone who strikes Iran will regret it". Haaretz. 14 June 2009. Retrieved 14 June 2009. 1 2 Government supporters rally in Iran. Al Jazeera. 16 June 2009. Retrieved 17 June 2009. ↑ Leading Iranian reformist arrested, his office says. Reuters. 16 June 2009. Retrieved 16 June 2009. ↑ Mark Memmott (16 June 2009). Iran's Human Rights Activists Being Arrested, Nobel Prize Winner Tells NPR. NPR. Retrieved 17 June 2009. ↑ Ashley Broughton (17 June 2009). Relatives: Iranian activist pulled from hospital bed, arrested. CNN. Retrieved 20 June 2009. ↑ Iran opposition politician Yazdi released - source. Reuters. 19 June 2009. Retrieved 20 June 2009. ↑ Iran: Halt the Crackdown. Human Rights Watch. 19 June 2009. Retrieved 20 June 2009. ↑ Iran prosecutor warns of death penalty for violence. Reuters. 18 June 2009. Retrieved 18 June 2009. ↑ "Iran closes Al Arabiya's offices in Tehran". Al Arabiya. 14 June 2009. Retrieved 14 June 2009. ↑ "Stop the blocking now". BBC News. 14 June 2009. Retrieved 14 June 2009. ↑ "Iran election sparks clashes". BBC News. 14 June 2009. Retrieved 14 June 2009. ↑ Ramin Mostaghim; Borzou Daragahi (14 June 2009). "Iran election anger boils; Ahmadinejad defends results". The Los Angeles Times. Archived from the original on 16 June 2009. Retrieved 14 June 2009. ↑ "Iran upholds Ahmadinejad victory, says matter closed". Reuters. 29 June 2009. Retrieved 14 June 2009. ↑ Freedman, Samuel G. (26 June 2009). "For Bahais, a Crackdown Is Old News". The New York Times. ↑ "Former Iranian Parliament Speaker Hadad Adel: BBC Teeming with Bahais; Stands for 'Bahai Broadcasting Company'". Middle East Media Research Institute News. 30 June 2009. ↑ Susan, Maneck (13 June 2009). "Accusations Against Baha'is within the Context of Islamic Heresiography". Cyber Proceedings. Salt Lake City, Utah: Centro Studi sulle Nuove Religioni. Retrieved 10 July 2009. ↑ "Human Rights in Iran and Egypt". Bahá'í World News Service. 28 June 2009. ↑ "Iran's supreme leader orders investigation into claims of vote fraud". Xinhuanet. 15 June 2009. Retrieved 20 June 2009. ↑ "Iranian protester killed after opposition rally". Yahoo. 14 June 2009. Archived from the original on 19 June 2009. Retrieved 20 June 2009. ↑ "Mousavi says not optimistic on Iran election appeal". Ynet. ↑ "Rezaei's ultimatum to Interior Ministry". Press TV. Retrieved 20 June 2009. ↑ "Iran's Rezaei withdraws election complaints". PressTV. 24 June 2009. ↑ "Iran's Ex-Foreign Minister Yazdi: It's A Coup". The Nation (The Dreyfuss Report). 13 June 2009. Retrieved 14 June 2009. ↑ George Galloway (15 June 2009). "You can count on the fact election was fair". Daily Record. Retrieved 17 June 2009. ↑ "Leader addresses nation in Friday prayers: Transcript". PressTV. Retrieved 17 November 2010. ↑ "News". Kodoom. Retrieved 17 November 2010. ↑ Erdbrink, Thomas (10 June 2009). "Ex-Iranian President Criticizes Ayatollah". Washington Post. Retrieved 17 November 2010. Kamalipour, Yahya R., ed. (2010). Media, Power, and Politics in the Digital Age: The 2009 Presidential Election Uprising in Iran. Lanham: Rowman & Littlefield. ISBN 978-1-4422-0415-7. Kamrava, Mehran (2010). "The 2009 Elections and Iran's Changing Political Landscape". Orbis. 54 (3): 400–412. doi:10.1016/j.orbis.2010.04.006. Morady, Farhang (2011). "Who rules Iran? The June 2009 election and political turmoil". Capital & Class. 35 (1): 39–61. doi:10.1177/0309816810393940. Honari, Ali (2014). "From Virtual to Tangible Social Movements in Iran". In Paul Aarts and Francesco Cavatorta. Civil Society in Syria and Iran: Activism in Authoritarian Contexts. Boulder,CO: Lynne Rinner. Wikimedia Commons has media related to Iranian presidential election 2009. A discussion with pollster Hossein Ghazian - IranWire in Persian.